How Does MovieEcard India Work? MoviEcard coupons, deals, and offers give every moviegoer an option to watch new titles at discounted prices. No one wants to go spend much on movie tickets. And, everyone knows how expensive refreshments and beverages are in theatres. Since it isn’t possible to get discounts on them, why not grab any one of MoviEcard offers and watch a movie at economical rates? MoviEcard deals and coupons save a lot. If you too desire to save yourself from spending much on movie tickets, MoviEcard discount codes are what you need to look for. We, Indians, are crazy about movies, whether we talk about Bollywood, Hollywood or Tollywood. Whenever we want to refresh our mind, go on a date, spend a day with friends, the very first place that crosses our mind is a movie theatre. After all, experiencing comedy, action, drama, and romance on a big screen is completely different that cannot be expressed in words. Though watching movies in theatres is fun, no one has enough money to spare on every new release. In such a situation, MoviEcard comes to your rescue. MoviEcard provides a subscription program that allows every moviegoer to watch ‘unlimited movies’ at a cost of Rs. 399 only. Take it as an E-card which opens the gates for the new releases for you. With a single MoviEcard, users can watch movies in more than 100 Carnival properties across India. If you believe that a MoviEcard is just a waste of time, you need to rethink. Everyone loves watching movies in theatres, of course, exceptions are always there, but the only thing that holds us back is our pocket. Movie tickets are expensive, there is no doubt. And, MoviEcard is the smart option with which you can go economical and experience the fun of watching movies in cinemas at the same time. MoviEcard gives you access to all new movies running in Carnival cinemas. What’s more? MoviEcard is not only your ticket to new movies at discounted rates, but it also gives out exciting MoviEcard offers and deals. Upon using such pocket-friendly MoviEcard discount offer or on applying exciting MoviEcard coupon code, you save more than expected. When you purchase a MoviEcard, you receive an MVC or promo code via SMS or email on the registered mobile number and email address respectively. To use MoviEcard, users have to apply this MoviEcard discount coupon at the time of purchasing the movie tickets. The discount will be auto-applied before payment. This way, you will be able to save more than expected. With Weekend MoviEcard, users will be able to watch unlimited new movies between Monday and Thursday. Under the offer, a user is entitled to watch a new title for once. In addition, a maximum of one movie can be watched in a day. With Bhasha MoviEcard, users can watch 3 movies between Monday and Thursday over a period of 30 days. Under the offer, users can watch one new title twice and a maximum number of one movie in a single day. The Bhasha MoviEcard is not applicable to films dubbed in other languages. With My MoviEcard, users can watch a new title between Monday and Thursday, over a period of 90 days. Under the offer, users can watch one title only once and a maximum of one film in a day. During the MoviEcard offer period, only one movie can be watched. With the April Bumper MoviEcard, users can watch up to two movies in a period of 30 days from Monday to Thursday. Under the offer, users can watch one title twice and a maximum of one movie in a single day. The MoviEcard cannot be transferred to another user and can be availed only by the registered cardholders. To obtain access to dubbed movies in other languages, users are required to upgrade their Weekday MoviEcard at Rs. 399. Recliners and sofa seats are not covered under the offer. Additional charges are applicable on 3D glasses. Movie ticket prices are subject to change without a specific reason or prior notice. Cardholders are entitled to use only one mobile number per card. Purchase a MoviEcard using your PayPal account and get up to 75% back. The maximum cashback that can be availed is Rs. 300. No MoviEcard discount coupon is required. Users can avail the mentioned MoviEcard offer on the first ever transaction done via PayPal account. The cashback will be given in the form of a discount code which can be used in the next PayPal transaction. The validity of the cashback will be for 60 days from the date of receiving the mail. Under no circumstances, the cashback will be sent to another user. The offer is valid only on domestic transactions. No two offers and schemes can be combined together. With the Times card users have an option to get unlimited movies at Rs. 340. The validity of the offer is till March 10th, 2020. All Times Cardholders are eligible to participate in the offer. In order to avail the MoviEcard offer, users have to make all payments via the Times Card only. Make sure to apply the MoviEcard coupon code “MVCTIMES” while availing the offer. HDFC Bank and Times Internet Ltd reserve the right to alter/modify/change the terms and conditions or discontinue/end the offer at any time, without prior notice or specific reason, at their discretion. On using the MoviEcard discount code “KWIK15”, users will get 15% back in the form of SuperCash in their Mobikwik wallet. It is a limited period offer. Under the offer, users are entitled to receive a flat cashback fo 15%. 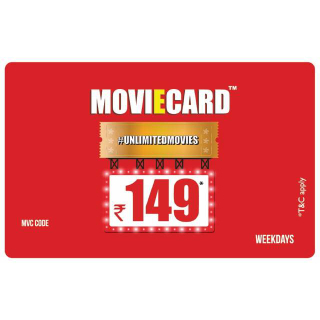 In order to avail the offer, users have to use the MoviEcard promo code “KWIK15”. The maximum cashback amount is capped at Rs. 100, which will be auto-credited to user’s Mobikwik wallet. The minimum transaction limited is set at Rs. 100. MoviEcard subscription is too good to resist. Now, you must be wondering from where you could lay your hands on those tempting MoviEcard offers and discounts. Well, the answer is very simple, to become a member or to earn a discount on movie tickets via MoviEcard, GoPaisa is the platform you need to explore. If you are crazy about earning cashbacks, GoPaisa needs no introduction. But those who are still unaware of GoPaisa’s capabilities - It is the highest cashback paying website in India that delivers offers and coupons along with exciting cashbacks. Whenever one shops at GoPaisa or avails a store’s deal, he gets mentioned cashback in the GoPaisa wallet. This amount can be further used on future purchases. Whenever you want to find current MoviEcard deals or need MoviEcard coupons, don’t go anywhere but come straight to GoPaisa. On the same page, you will find numerous MoviEcard offers that can be used to avail discounts and cashbacks. So, what are you waiting for now? Visit the GoPaisa and start exploring the best suited MoviEcard coupon codes right away.